Two more days on our CD sale. You can also get this at the Demicon Lite show in Des Moines today! We got hit by more medical bills for one of my kids. Nothing scary, just expensive. So we are having a sale of Cheshire Moon stuff. This applies to North America and Europe. Mike Whitaker has a bunch of our CDs (the stuff that didn't arrive until after we left England). Payments via Paypal to cheshiremoonband at gmail dot com. If you don't have our CDs, or are missing a couple, this is a great time to get caught up, and to help us out in a messy time. Because I am a twit, and forgot to mention it on the show. SJ Tucker, Ginger Doss, Renee Janski, Lynda Millard, Ronda Jean together live on Concert Window tonight! We are on the air at 2 EST! After two years of litigation, a U.S. district court has ruled in favor of "Oh, the Places You'll Boldly Go! ", published by ComicMix. The estate of Theodore Giesel (Dr. Seuss) had sued, claiming copyright infringement. ComicMix held it was a fair use parody. The 2 Live Crew decision, which covered similar ground, led to a lot of false claims that anyone was now free to produce any kind of parody. Neither decision says that. The court ruled that ComicMix "is a highly transformative work that takes no more from the Dr. Seuss books than necessary for its purposes." "Transformative" means that it does something different from the original. Taking no more than necessary was also a basis for the 2 Live Crew decision. There's no reason to overstate the scope of the ruling. This is a big win for parody mashups just as it is. Paaaaaaaaasadena... and a few other places. The Pasadena Folk Music Society, along with the Pasadena Public Library, presents a very different kind of show in 8 days, Saturday, March 23 at 11:00 AM at the Pasadena Central Library and the program is free! Cambalache is a unique Los Angeles-based group that you just don't get many opportunities to hear. We learned of them at last year's FolkRoots Festival (this year's festival is coming up on April 13!) and we felt that it was time that we present some music from south of the border. The group is led by Cesar Castro (vocals and requinto), who grew up in Veracruz, Mexico, and became fascinated with son jarocho music, the mix of African, Spanish, and the indigenous culture of the Caribbean. You may not be all that familiar with son jarocho music, but this show is a perfect opportunity to find out about it. Cesar is joined by his wife, Xiochi Flores (vocals, jarana), who does a bit of dancing, Chuy Sandoval (jarana, electric guitar), and Juan Perez (electric upright bass). The music is joyous and fun, mostly traditional, with a few originals. 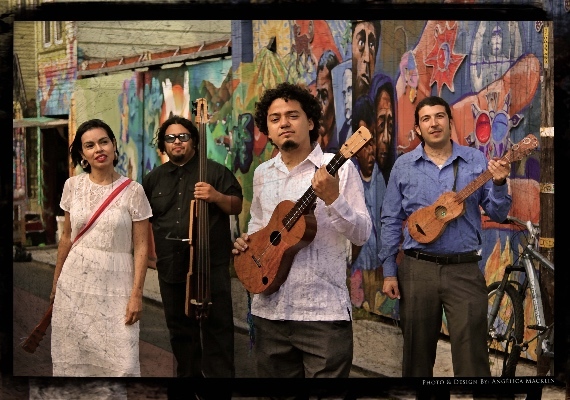 Get a taste of their music from a performance of La Iguana at the Ford Theater, with the common call and response heard in son jarocho. Get a look at Xiochi's dancing from this show up in San Francisco. She'll probably have the kids and some of the adults up and dancing a bit. They sing in Spanish, but tell you about the music in English. This will be a family show, perfect for kids and adults. Cesar is a luthier, and he'll likely talk about the instruments a bit, and you will also learn about the music. We are able to make this a free show with a generous gift from the Topanga Banjo Fiddle Contest & Folk Festival folks. In their spirit of encouraging musicianship for all ages, we wanted to especially appeal to the youth, and we hope to have a good representation of parents with children, but we're confident that there will be room for people of all ages. Tell your friends! Bring some kids! This show will give you a strong appreciation for the music and the rich heritage of Mexico. Whoops, forgot to include the upcoming Pasadena performances until they already went, here's a list of upcoming stops on the Tannahill Weavers' North American tour I just received. Not in Pasadena this time, but they may well turn up in the area of someone out there. If so, go see them! This RT^&* thingie keeps eating my cuts. Here's the list by itself. I hope. "I want to make it as easy as possible for people to get to know my music. So I am setting two of my albums on Bandcamp to 100% free. There's no hitch, no need to sign up to a mailing list or pay anything. Just listen and download. Share the links. They will be good through St Patrick's Day. I want as many people as possible to hear them. I really appreciate your help. Thank you! Marc"
note: these are both lots of fun! The latest Becky Chambers book, _Record of a Spaceborn Few_, is 1.99 on amazon & bn.com. I don't know about elsewhere. We'll see that day come round. It'll be out Wednesday morning! Patricia Wrede's 5 Lyra novels are on sale for 2.99! I don't know about elsewhere. More from the Pasadena Folk Music Society (This isn't the whole of the newsletter - I recommend subscribing if you want to hear about other stuff going on in the area). We'll soon slip into February, and the Folk Music Society has two shows in this short month. We start with Honey Whiskey Trio, three young women who have been turning heads with their harmonies, and dramatic body percussion and movements, on Saturday, February 2, at 8:00 PM in Beckman Institute Auditorium. Courtney, Ann Louise, and Christina develop and arrange their own stirring harmonies and body percussion (hand clappin', finger snappin', leg slappin', and foot stompin') with synchronized movements. On some songs, they play guitar, mandolin, banjo, and shruti box (come find out what that is!). They create, arrange, and explore music from the front porches, music halls, and hymn books of early America, sharing it with adults, students, and life-long music lovers across the United States. Lisa Forkish, of the A Cappella Association wrote, "They always leave you sitting at the edge of your seat, waiting with bated breath for each new beautifully executed phrase." Hear them sing their namesake song, Sweet Honey Whiskey and hear a good sampling of what they do here. These women give their all with their singing, and they just might steal your heart in the process! The new FilkCast has escaped and is out and about in the world! It's available on iTunes and Google Play! My only question is, why do there seem to be no South American Filkers? If anyone knows any filkers down that way, send them a link! This week FilkCast features Brooke vs John, Seanan McGuire, Joe Giacoio, The Unusual Suspects, Tianna and the Cliffhangers, Erica Neely, and Karen Linsley! The Five Senses set [3 books] is 1.99! ericcoleman - Live on the radio! ericcoleman - Two more days on our CD sale. ericcoleman - Cheshire Moon CD Sale! ericcoleman - Tonight on Concert Window! kayshapero - Paaaaaaaaasadena... and a few other places. filkferengi - 2 free Celtic albums! ericcoleman - This week on FilkCast! filkferengi - Patricia Wrede's 5 Lyra novels are on sale for 2.99! ericcoleman - FilkCast Episode 6! filkferengi - Andre Norton e-book deal!